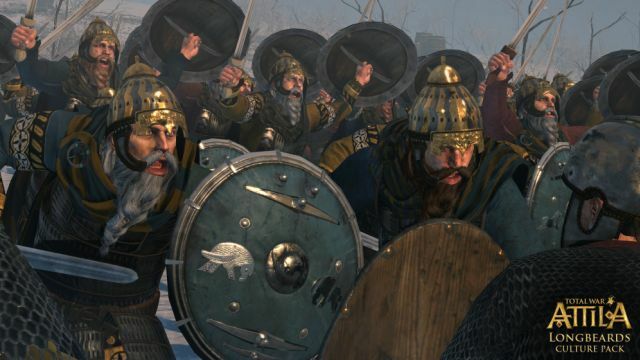 The first Total War™: ATTILA downloadable content from the ‘New Content Team’ at Creative Assembly, The Longbeards Culture Pack, brings three new playable factions to Total War: ATTILA. The Langobards, the Burgundians and the Alamans may be used in single or multiplayer campaign modes as well as custom and multiplayer battles. Alongside new unique units, buildings and objectives, a new feature called ‘The Lay of Ybor’ presents the player with a series of linked narrative events, with a series of branching narrative choices. As the story draws to its conclusion, Ybor himself becomes available as a general for your armies, complete with traits that mirror the choices you have made. The Total War ‘New Content Team’ at Creative Assembly last worked on the Wrath of Sparta Campaign Pack for Total War: ROME II and are now getting to grips with a rich roster of new DLC and free content planned for Total War: ATTILA. For further information on the contents of the Longbeards Culture Pack, check here.